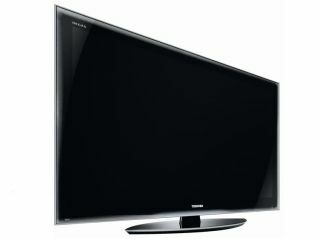 Toshiba has been a slow to jump on the LED bandwagon, but it's now firmly aboard. The company today announced its first LED-backlit LCD television, the Regza SV series. Like other manufacturers, Tosh's flagship flat-screen offers local dimming and an impressive dynamic contrast ratio - here reaching 2,000,000:1. Deep Lagoon styling, which has the exterior screen sitting flush with the front of the frame. The effect is produced by a panel that sits over the front of the TV, making for a unique design effect and, purportedly, improving contrast and colour ratios. The SV screens all have Resolution+ (to upscale standard def sources), 200Hz motion scanning, AutoView (calibrating the screen automatically depending on ambient lighting) and MetaBrain control so all the technology doesn't just deliver a big, fat mess. The SV devices are DLNA compliant, have four HDMI ports (on the sparse side these days), PC/USB inputs and use Dolby Volume to keep those pesky commercials in their place. The screens will be available in the UK shortly, at a price to be confirmed.